INTEGRA, ESTREAM, COLABS.EU and IANIS+. Following her interests in training and use of ICT in education, Eleonora started a collaboration with the University of Torino to set up a research lab on Elearning and Digital Communities called KEILab (http://www.keilab.csp.it). 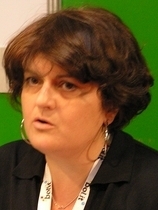 She was also involved in the SMARTLab (http://www.smartlab.csp.it), a research lab on web 2.0. Eleonora is also a member of the Open Access group of CRUI (Conference of Italian University Rectors). She also hosts the OER Italy website. We are living the dawn of a new way of learning: personal, social, open… several adjectives that testify how digital networked media are changing the knowledge landscape. In this picture, the openness paradigm is contributing to modify the educational system: share, use and remix are the new keywords. From the first MIT OpenCourseWare initiative of 2001, the open education movement has made significant advancements. OERs and Open Education initiatives could represent a new business for higher education institutions, a kind of “uncharted territory” that brings with it the possibility of reaching many more learners but also new kinds of learners, with different needs and expectations, and providing for them flexible courses at a lower cost. New kinds of institutions are growing rapidly outside the traditional university system, including DIY U, P2P U, OER U.
OERs have gained momentum, but there are still important challenges for the future: changing the attitudes of many teachers, providing quality assurance, re-creating a new open chain for the production and distribution of open e-textbooks and turning open accreditation into an opportunity, rather than a “low cost” education system. Russell Stannard is a Principal Teaching Fellow at the University of Warwick. He runs www.teachertrainingvideos.com which has become one of the most popular training sites for teachers on the Internet and provides free step by step videos to help teachers incorporate technology into their teaching. Russell has one several big awards including the British Council ELTons Technology award and the Times Higher award for "Outstanding Initiative in ICT". In this talk Russell will present some of this ground breaking work on the areas of communication, sharing and engagement. He will demonstrate 3 tools that are easy to use but can have an instant impact on our teaching and learning. It will include the work Russell has done on feedback, which has been widely covered in the British media and given Russell an international reputation.